Jason Johnson has been trying to shake off the notion that he is just a 360 driver trying to make it in a 410 for the last few years. 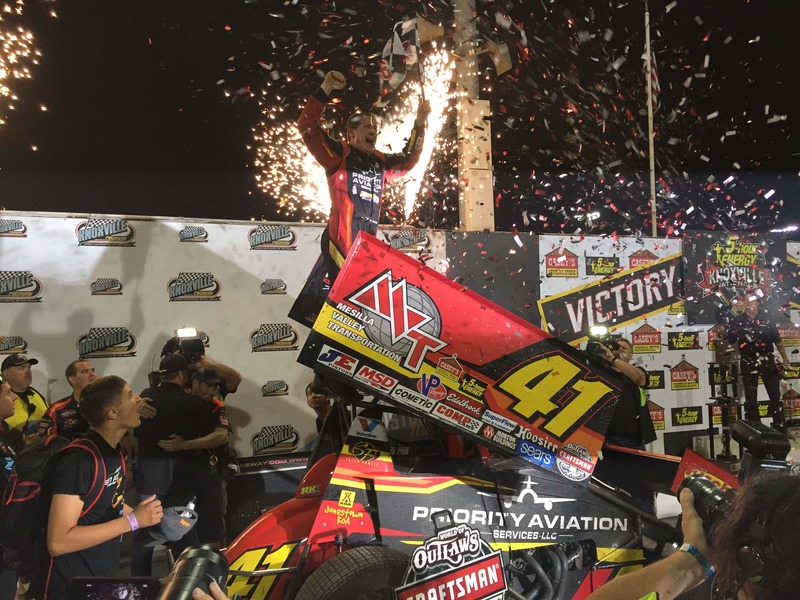 Saturday night he erased all doubt that he could compete with the best sprint car drivers on the planet by holding off Donny Schatz to capture his first Five Hour Energy Knoxville Nationals with a dramatic win by .16 of a second. Pole sitter Daryn Pittman set the pace early leading the first ten laps, but Johnson moved ahead for a lap then Schatz moved in front for 13 laps which included the mandatory fuel stop on lap 25. Johnson held the lead for 23 of the final 25 laps, however Schatz and him touched numerous times and slid each other nearly every lap down the stretch when the lead changed hands twice in the final seven laps. Shane Stewart came home third, with Pittman in fourth, and NASCAR Star Kyle Larson roaring from 21st after winning the B-Main to get fifth and hard charger. Matt Juhl was named the Rookie of the Nationals.